One team, the Detroit Tigers, want Cuban defector Ruseny Castillo as soon as possible, hoping he’ll join them in time to help with their playoff hopes or in the postseason already. For the Boston Red Sox, it’s an attempt to solidify their situation in the outfield, as it’s quite clear nothing good is going to come out of the 2014 season as far as they’re concerned. At 27, with the ability to play center field but also shortstop and other infield positions, Castillo has based himself in Haiti last spring and last month held a workout in Florida, viewed by 28 of the 30 MLB teams. 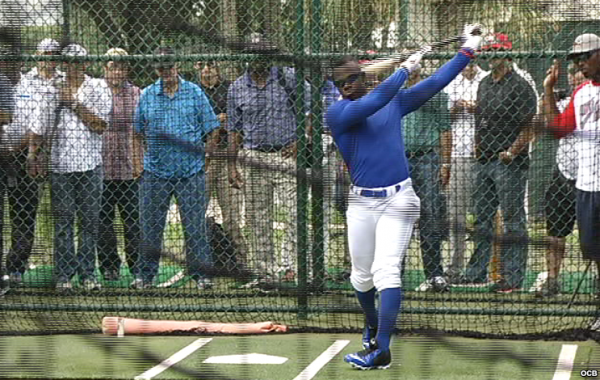 While he has been compared to other big hitting Cubans like Yoenis Cespedes or Jose Abreu. His size (5-9, 185 pounds) and his combination of power and speed has drawn comparisons to Yasiel Puig and Andrew McCutchen. The Red Sox would love to add him to an outfield that now holds Cespedes as well since making a trade that landed them the outfielder from the Oakland A’s. For the Tigers, who have lost the lead in the AL Central recently, it’ll be an attempt to fill the hole at center field left after trading away Austin Jackson in order to acquire David Price in a three-team trade that also included the Tampa Bay Rays. Right now, the projection is that Castillo will sign a five year deal that will go somewhere between $50-60 million, which would make it the second-largest deal ever signed by an amateur player from Cuba or any other country, behind only Jose Abreu’s six-year, $68 million contract with the Chicago White Sox. Because he is older than 23 and played five seasons professionally in Cuba, he is exempt from international signing-bonus pools. Castillo is 27 and is represented by Jay Z’s Roc Nation Sports. He should be making his decision no later than the end of this weekend.